To our left, a herd of impalas is fanning out into the setting sun. To the right, a solitary springbok stands frozen by a mix of curiosity and fright. In between, sand, salt, and stones stretch all the way to a horizon separated from the dark blue sky by a panoramic cloud of dust. 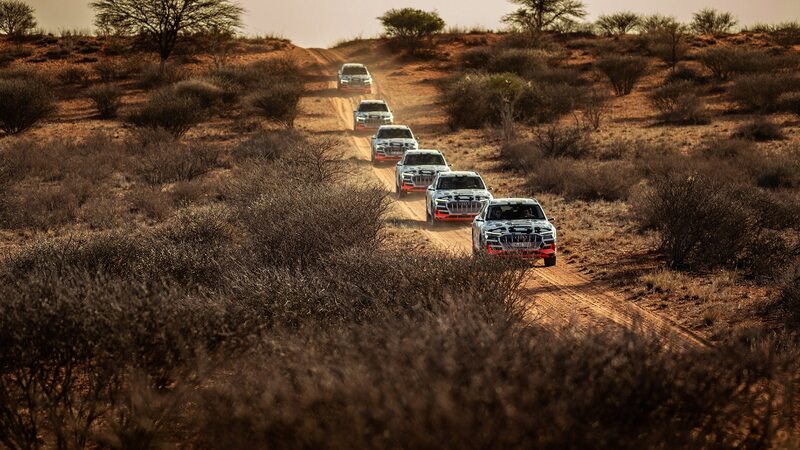 The flat tableland at the bottom of Namibia’s Kalahari desert is ten times the size of a football field for giants—all that´s missing are the goals, the corner flags, and the faintest trace of grass. 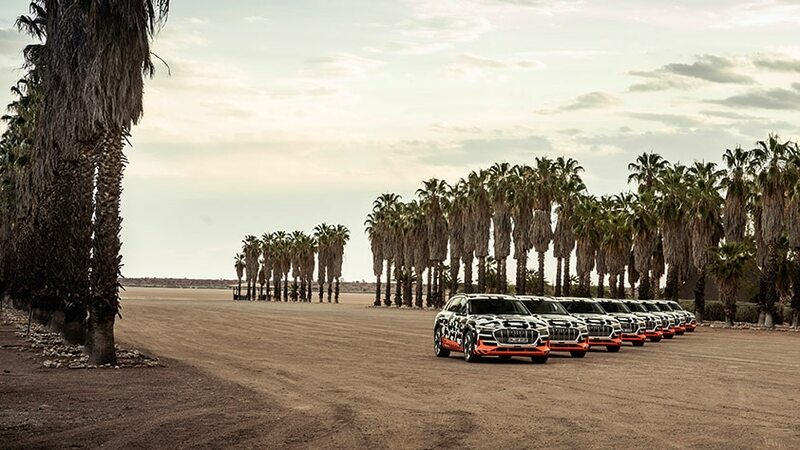 For one day only, this flat, open expanse has been converted to a kind of freestyle rallycross stage for six 2019 Audi E-Trons coated in psychedelic swirls not unlike the rock paintings of ancient residents. Water is a precious commodity in this scorching hot basin, but thanks to a few rows of makeshift solar panels, freshly harvested electricity is not. 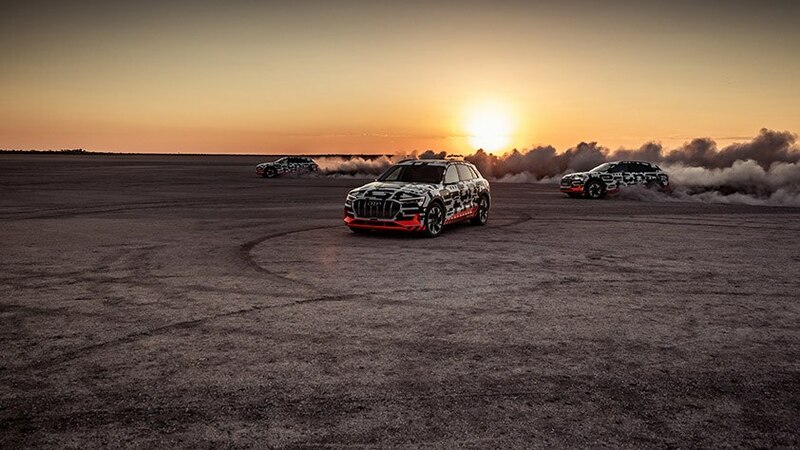 It´s an eerie scene, spectacular yet unreal, a handful of Audis drifting almost noiselessly through no-man´s land, never changing gear or hitting a redline. Vorsprung durch CO2-neutral powerslide, so to speak. When the dust finally settles, one can decipher cones, an unusually wide racing line, and a white tent next to what must be the start-finish line. We get five laps per driver through a nearly mile-long ribbon of corners fast and slow. The surface looks like a thin coating of toasted breadcrumbs, but it is as slippery as loose snow on frozen earth. Even with ESC on, the handling attitude changes with every blip of the throttle. Deactivate it, and your inner Sebastian Loeb will grin from ear to ear before switching to attack mode. Back in the pits, the crew routinely adjusts the tire pressures and checks the state of charge. While the miles-to-empty readout dropped a couple of digits during our fun, the battery never failed to deliver full power on demand. 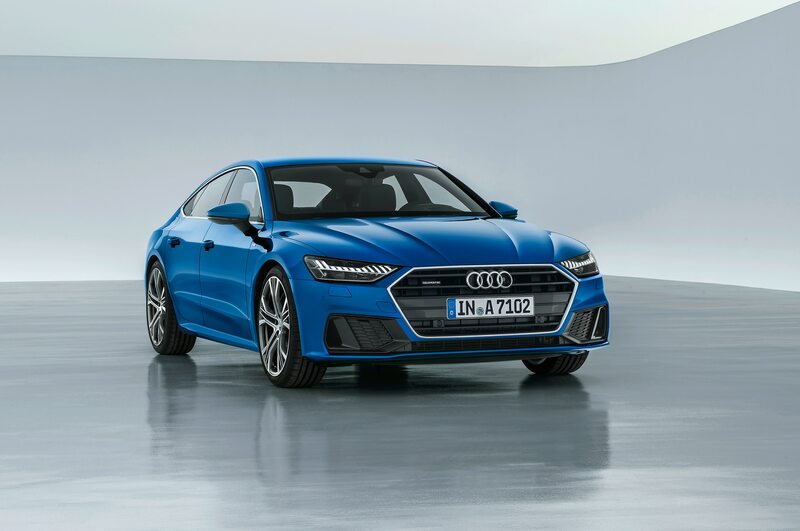 Audi’s new E-Tron, aims squarely at the new Jaguar I-PACE, Mercedes EQ-C, Porsche Taycan Cross Turismo, and Tesla Model X. The silent newcomer, loosely based on the Q5 and Q7 crossovers, will be priced around $90,000. It fields two electric motors rated at up to 402 hp and 490 lb-ft, and a 95-kWh battery good for a driving range of around 250 miles. 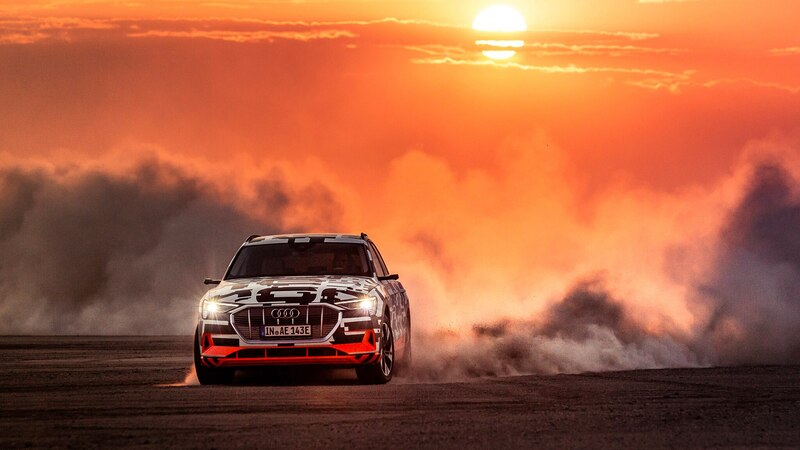 “The E-Tron is not a one-hit wonder,” says Markus Siewert, one of several project engineers. “We can do repeat action better than anybody else. 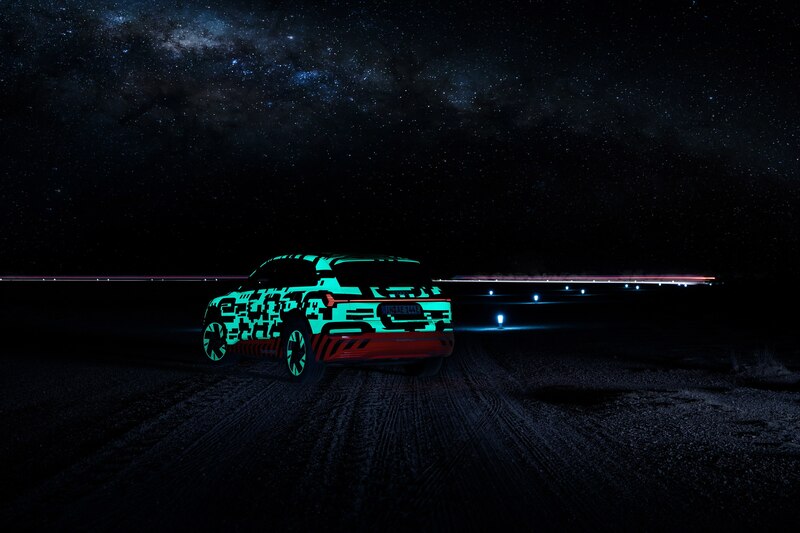 The E-Tron, for instance, accelerates ten times from nought to sixty without dropping a single tenth over the entire cycle. On the autobahn, you are invited to nail the pedal to the metal for twenty long minutes—and I promise you the top speed will not budge one bit over time. Eventually, power is progressively scaled back to prevent overheating. A similar measure is taken when the car struggles to reach the nearest charge point. But even in case the range meter drops to zero, we still have a buffer built into the system.” Although the numbers are not yet cast in stone, one source claims that the driving range of the E-Tron will be certified at 265 miles according to the WLTP norm, though how that might translate to an EPA rating for the U.S. is unclear. Even in winter, with cold motors and cold batteries, Audi says 200 miles of range is a realistic point-to-point average. 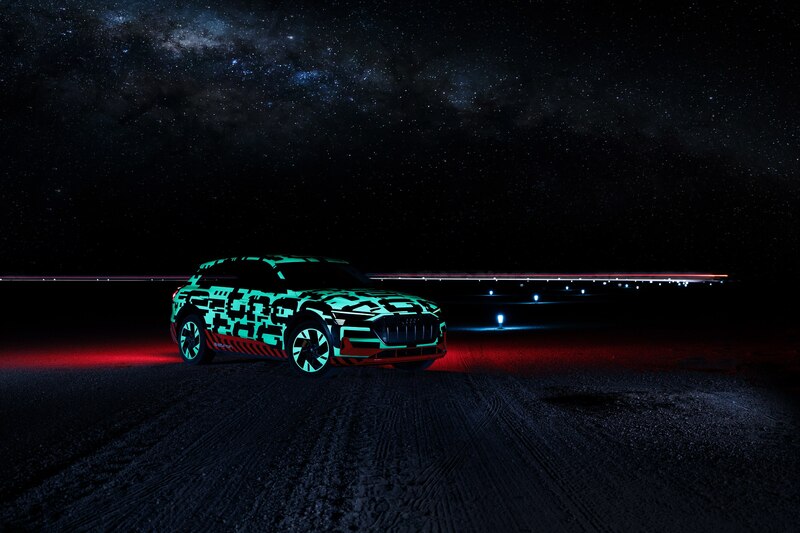 Late next year, insiders are expecting a performance version of the E-Tron rated at approximately 503 hp, but right now the maximum power output is 402 hp. Even this number is only available for ten seconds in boost mode. The next step down is called peak mode. It musters 355 hp and 414 lb-ft for up to 60 seconds. Under normal driving conditions, the E-Tron will use the rear motor primarily, which is good for 188 hp and 231 lb-ft of torque. If the driver requests more grunt, the second motor rated at 168 hp/182 lb-ft will jump in to drive the front wheels. All-wheel drive and torque vectoring are activated within milliseconds, providing top-notch traction and laser-beam stability. With ESC switched off, the rear-wheel bias invites you kick the tail out, which is a lot easier on an African salt lake than on high-grip European blacktop. 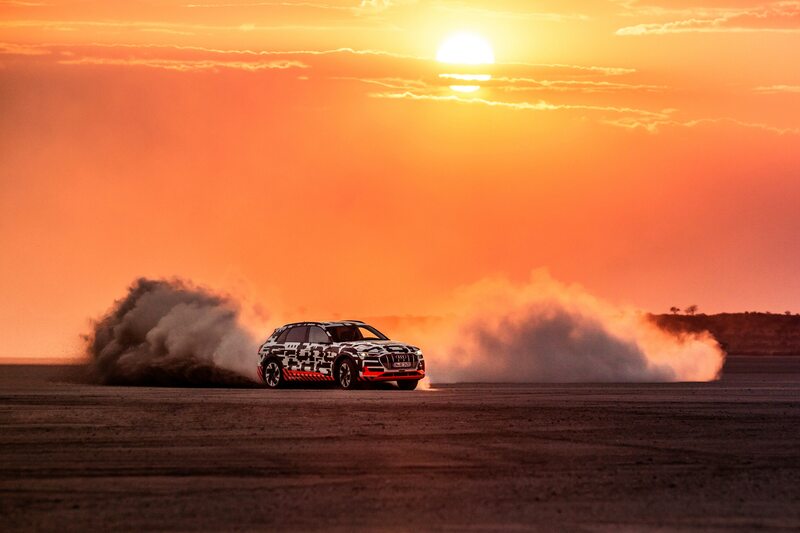 Our test car was fitted with 21-inch energy saving tires, which destroyed the ride but offered plenty of cornering grip. Although the steering always tells the full story, it feels somewhat artificial throughout its range. Powering the two induction motors is a 95-kWh high-voltage energy cell, weighing in at a whopping 1,543 lbs. The battery can be fast-charged with up to 150 kW at a network of service stations currently under construction. Audi has partnered with Electrify America to build 500 fast-charge stations in 40 states by 2019. While fast charging takes about 20 minutes, plug-in charging at home is an eight-hour affair. 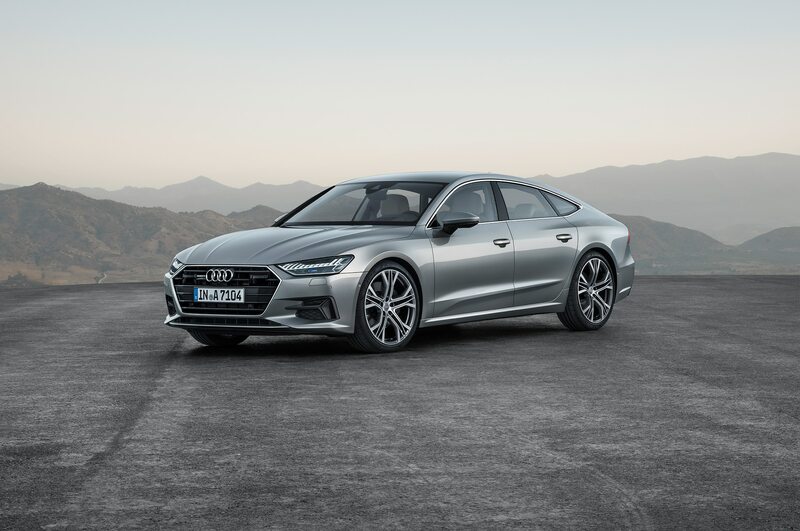 To speed up the process, Audi is offering a more powerful wall box and a second onboard charger. The killer app of the fast-charger? An 80-percent charge in just 30 minutes. 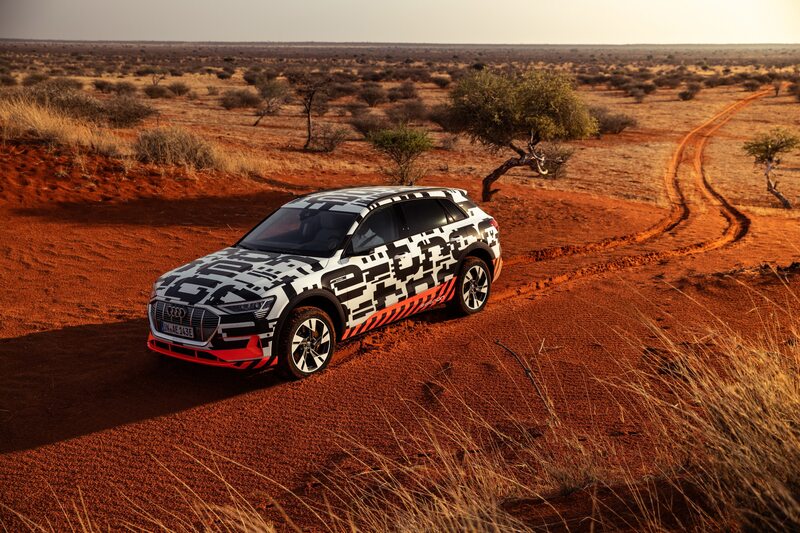 Inside, the E-Tron does not differ dramatically from the new Q8, A8, A7, and A6. 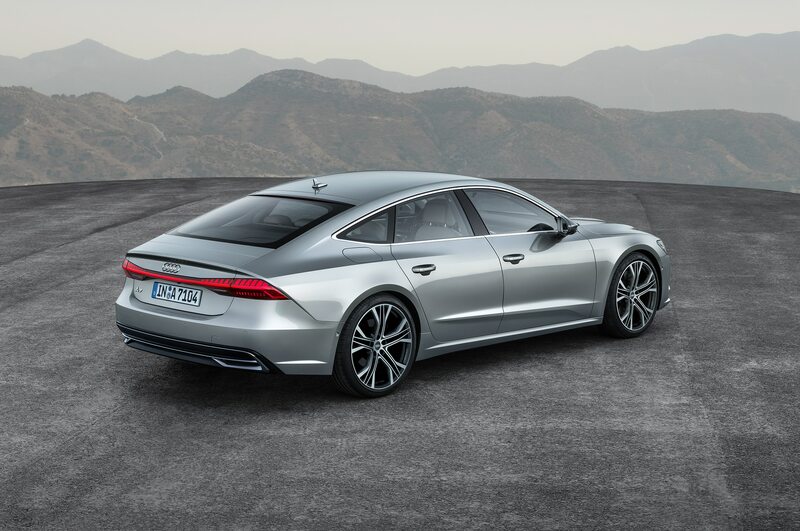 The only obvious exceptions are the optional camera-based rear-view devices, which are lighter, narrower, and more aerodynamically slippery than conventional mirrors. They also take time to get used to, because your eyes must learn to focus on the displays in the top forward corner of the door panels. This works ok on the passenger side, but the driver finds the upright, non-adjustable screen much harder to read. On the credit side, the slim camera-equipped view finders will switch to a smaller image on the autobahn to emphasize the speed difference between fast and slow moving traffic, the system automatically extends the lateral view as soon as the indicator is set, and it dials in a bird´s eye perspective paired to a curbside zoom when parking. 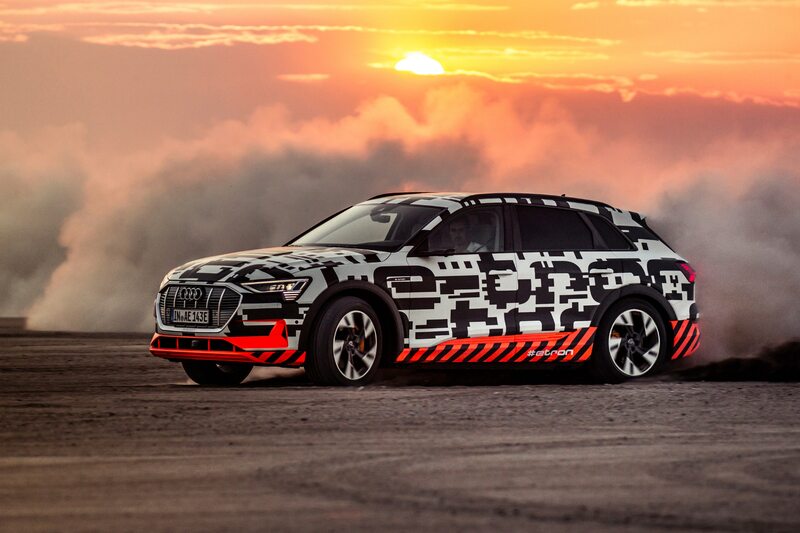 By tapping the intelligence of the cloud, the E-Tron driver is led to empty parking spaces, receives fog, black ice, and accident warnings, and is cautioned should a mobile speed trap pop up. In typical Audi fashion, there are seven different choices of tune, from eco to dynamic. In addition, you are invited to dial in one of three overriding settings labeled comfortable, balanced, and sporty. The fourth option is individual, which allows you to preset stability control from steadfast to leery, dampers from quite firm to quite comfortable, steering effort from featherweight to heavyweight, and drivetrain from attentive to aggressive. 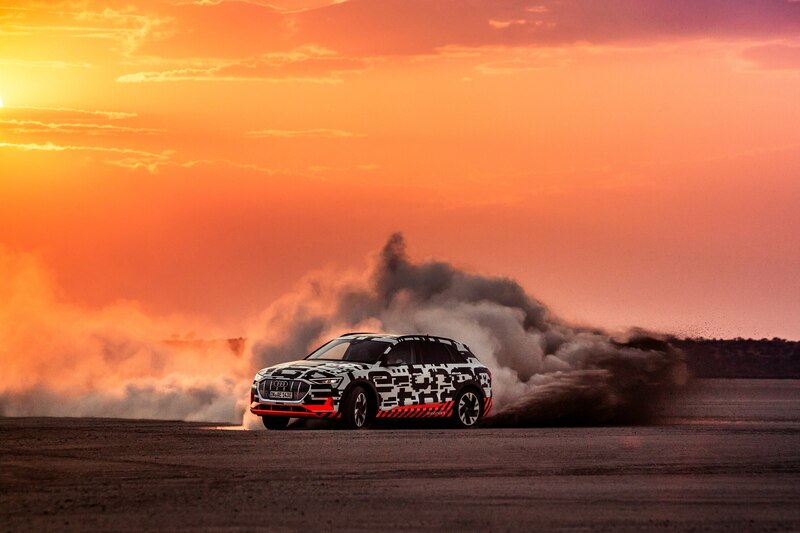 The standard air suspension can be jacked up in two steps by 1.38 inches (35 mm) in allroad and by 1.97 in (50 mm) in off-road mode. Above 62mph, it automatically lowers the ride height by about 1 in (26 mm). The electronic e-quattro AWD system is significantly quicker to act and react than its combustion-powered counterpart. 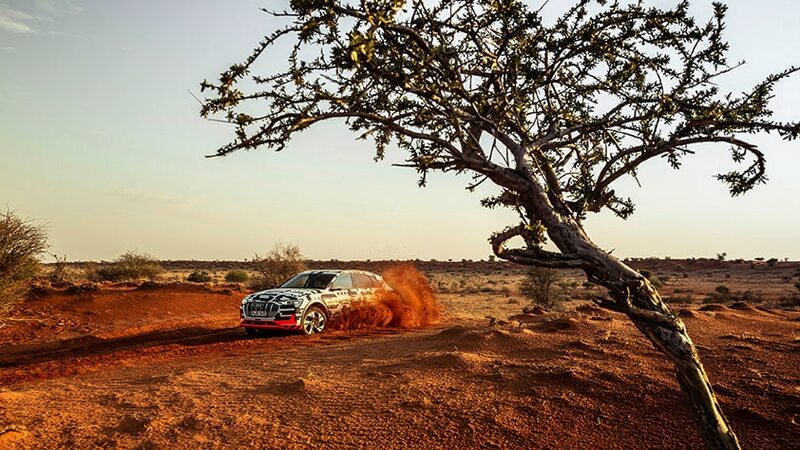 In fact, the energy flow to the four wheels is so rapid that the car responds to a puddle almost before it hits it. The battery pack, made up of 36 modules, is mounted between the axles as low as possible to push down the center of gravity. 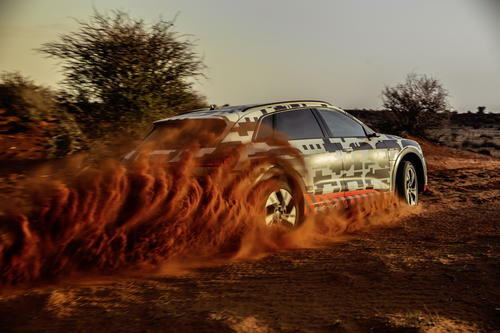 Measuring 193 inches in length and sitting on a 115.3-in wheelbase, the E-Tron is shorter than the Q8, narrower than the Q5 and lower than the Q7. Its cargo bay holds 28.5 cubic feet of gear (57 with the rear seats down), and yet the drag coefficient is a best in class 0.27. The first all-electric Audi is an amazingly quiet zero-emission cruiser. Wind noise, road noise, and drivetrain noise are so well muffled that one instinctively reaches for the non-existing outside manual claxon to warn cyclists and pedestrians. The silence is in fact so overwhelming and persistent that half a decibel of extra kickdown whine would probably be quite welcome. 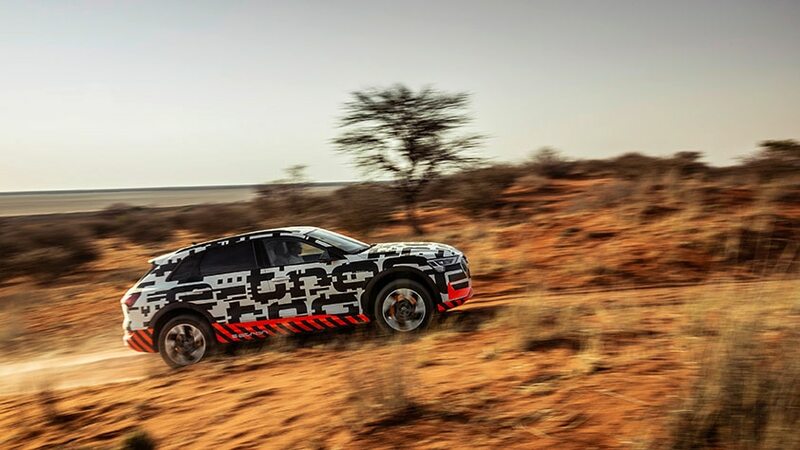 After all, the E-Tron puts speed into perspective in a way that makes you wonder whether full throttle actually unleashes all the forward thrust there is. 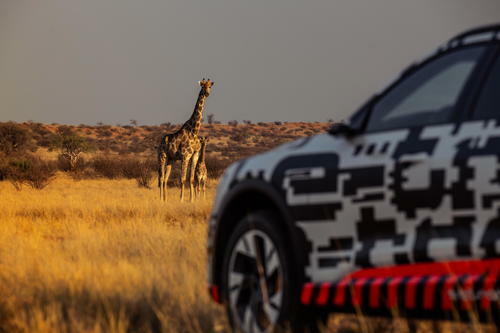 If our first encounter is anything to go by, the acceleration from 60mph upwards is overshadowed by the unreal mid-range urge of a Tesla 100D, the fierce low-speed pick-up of the 294-kW Jaguar i-Pace and the awesome tip-in of the 300-kW Mercedes EQ-C. The E-Tron is a quick car, no doubt. But it does not release that torque avalanche with quite the same urge and enthusiasm as its rivals. 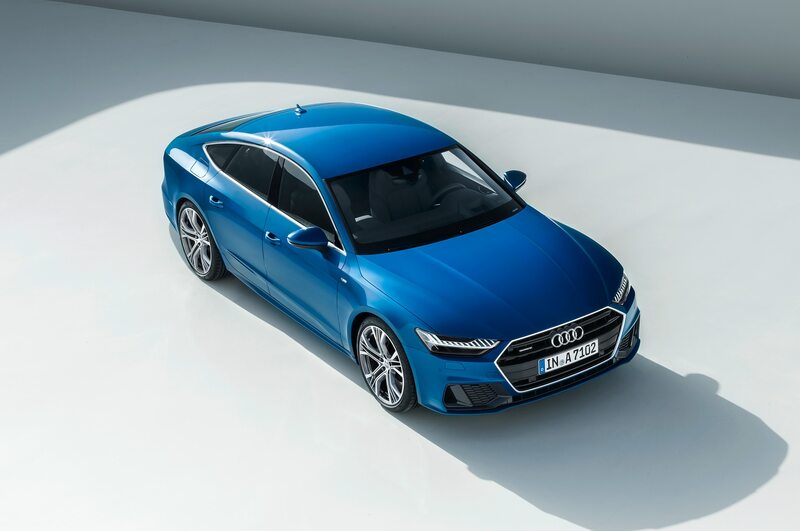 Waftability is a key target for every electric car, and this also applies to the all-electric Audi, which comes prepared for level 3 autonomous driving as soon as it becomes legal. The vibration-free motors, the absence of virtual or actual gear changes, the punchy power delivery, and the hush-quiet noise level make this a perfectly relaxed and sufficiently brisk grand. The laid back dynamics are supported by a flat ride, nicely suppressed body movements, and enough instant oomph to pull away from trouble. Dislikes? 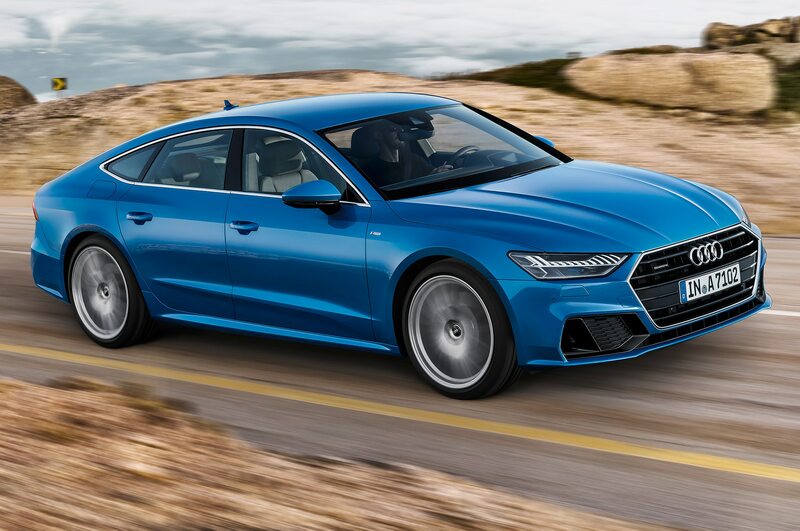 Nose dive under hard deceleration, go-for-it take-off squat, a steering that is too light in comfort mode and too heavy in dynamic, and a set of brakes that deserves its own paragraph, together with the Audi energy regeneration strategy. Intelligent recuperation helps to extend the driving range by up to 30 percent, says Audi. There are two different methods working hand in hand: lift-off regeneration and brake regeneration. In both cases, the e-motors act as generators and convert kinetic energy back into electric energy. By pulling the up- and downshift paddles behind the steering wheel, you may increase or decrease regeneration in two steps. Up to 0.3g of deceleration, you can either coast or make use of the regen, which is strong enough to create that coveted “one pedal” driving experience. Beyond 0.3g, the hydraulic 18-in disc brakes take over. In regenerative braking stage 1, the car slows down at lift-off, but nine out of ten stopping maneuvers can still be executed without even touching the pedal. Stage 2 virtually doubles this regeneration effect, which explains why it is better at charging the batteries than at putting a smile on your face. At this point, the E-Tron is the only BEV which can recuperate via e-motor, hydraulic brakes, and a combination thereof. 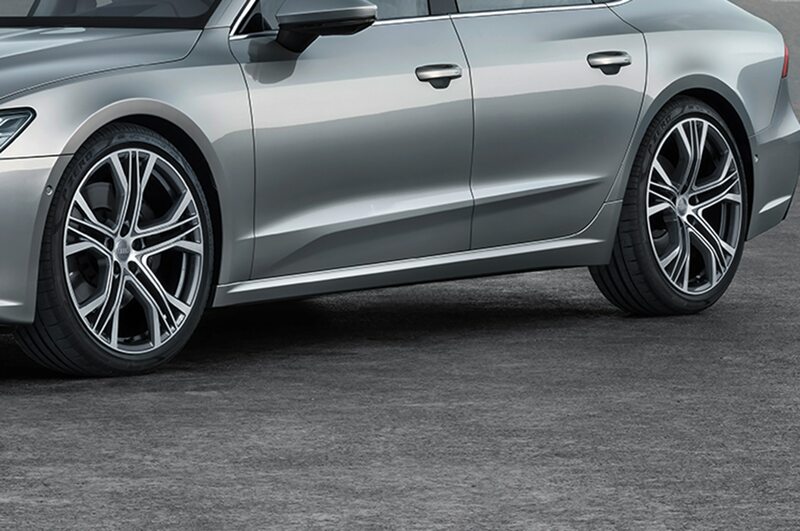 The transition from passive to active stopping power is smooth and seamless, but since this Audi is by nature more interested in saving energy than pushing braking points further forward, it takes a determined and heavy right foot to reel in the car to a total standstill. 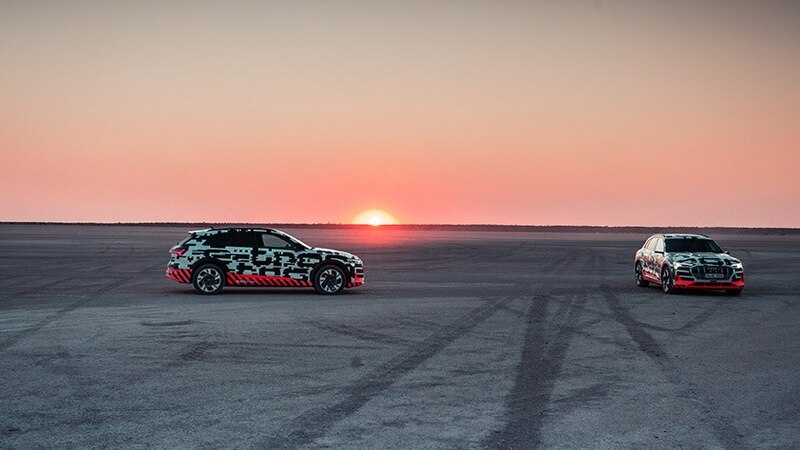 In the heart of the Bitterwasser salt plains, we locked ESC in play mode, set all systems in dynamic and worked the car hard until the state-of-charge readout dropped to single digits. By the time we were done, we’d scattered the local wildlife to the horizons except for a pair of wheeling vultures watching like stone-age drones as the future unfolded below them.